Proof that small can be beautiful and the hybrid hardware/software alliance is still going strong. Portability/functionality balance is impressive. 5000 tweakable software sounds from classic Arturia synths. Intuitive to drive the software from the MiniLab keyboard controller. Arturia is no stranger to hybrid software/hardware combination instruments. Its newest, however, attempts to redefine how much flexibility and functionality you can squeeze into a hardware case whilst retaining playability. The result is MiniLab, which offers a 2-octave mini-key keyboard, with no fewer than 16 dials and eight pads above this to complete its main control set. Throw in four function buttons and two control strips to substitute for pitch bend and modulation wheels and you quickly realise that MiniLab offers as many, if not more, control options than some rival keyboards over twice the size. Already, this is an intriguing prospect. "The download of Arturia's 'Analog Lab' software gives access to 5000 sounds accumulated from its flagship soft synths"
However, the hardware keyboard only forms half of the MiniLab 'package'; the other part is the download of Arturia's 'Analog Lab' software giving access to 5000 sounds accumulated from Arturia's flagship soft synths, including the Jupiter 8V, MiniMoog V and Prophet V to name but three. Many of these 'full titles' have been reviewed on this site before, so we won't dwell on their capabilities here but suffice to say that as Arturia's reputation was built on its modelling prowess, it's no surprise that the sounds on offer here are almost universally stunning. They're organised into a database too, so it's simple to search for sounds by instrument type, genre or from a particular synth, significantly cutting down time when searching for a specific sound. Frustratingly, we do need to advise you that installation of the software isn't quite as straightforward as Arturia's short-cut installation guide suggests. Understandably, the software is protected, using your choice of a hardware USB dongle or the eLicenser application. No problem there. However, you'd be wise to register your purchase to obtain your licence and get authorised before running the software, rather than attempting to achieve authorisation through launching 'Analog Lab' for the first time, as the manual suggests. Doing this crashed the software app several times before we found this workaround, so consider yourself forewarned. "The sheer quality of the sounds justify the price point for MiniLab in their own right"
Installation frustrations are soon eased once you're up and running, however. The sheer quality of the sounds helps enormously (these can be played from any controller keyboard, so if you happen to leave the MiniLab hardware at home, you'll still be able to use the software), as these justify the price point for MiniLab in their own right. However, the fact that they're all set up to be 'driven' from the keyboard's control surface with listed parameters for each patch sweetens the deal yet further. The pads (of which there are two banks) are designed to trigger chords - there's a tab on the right-hand edge of the GUI which lets you choose a key-note and a chord type (major, minor, 7th, diminished etc) for each pad, so it's very easy to trigger a chord progression with these whilst adding bass or lead with the keyboard. 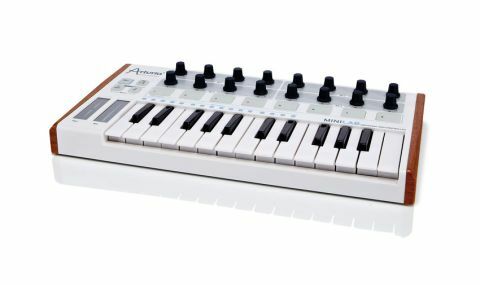 Of course, the usual limitations of mini-keys apply here (this reviewer has never been a fan) but they're reflective of the overall 'small is beautiful' philosophy Arturia have adopted here, so the decision is certainly forgivable. With plenty of sonic editability, Multi and Live modes, iPad compatibility and more besides, at this price point, MiniLab is excellent. Yes, the keyboard size, the software installation process and the finger-strip substitutes for Pitch and Mod wheels are compromises but, in the grand scheme, these can be lived with. Less is certainly more here.